What do people want from a popular book about physics? Of course, there’s no one answer to a poorly posed question, but last year’s monthly top-ten lists of science bestsellers from the New York Times might give us some hints. For instance, 2016 was particularly kind to Randall Munroe, whose books What If? (2014) and Thing Explainer (2015) managed to bob up consistently among the economics tracts and medical histories that filled out the lists. It’s not hard to see why. Munroe’s webcomic xkcd has a devoted cult, and his books carry out the same sorts of Oulipo exercises of constrained exposition that his readers enjoy. In What If? Munroe answers reader-submitted questions with a poker-faced wonkishness (“What if I took a swim in a typical spent nuclear fuel pool?” gets a technical answer, illustrated by stick-figure cartoons), and Thing Explainer uses the thousand most commonly used English words to explain everything from human organs (that is: “the bags of stuff inside you”) to microwaves (or: “food-heating radio boxes”). Munroe writes for an audience of science fans, readers who don’t need to be convinced about the scientific backdrop of the world. But 2016’s other dominant physics title was designed for that other type of pop-sci reader, the reader who is only interested enough in science to want the basic talking points. Seven Brief Lessons on Physics (2016), by the Italian physicist Carlo Rovelli, goes by briskly. At just over eighty pages, the book has little to discuss and little to criticize — an executive summary of the greatest hits. It starts with Einstein, does quantum mechanics, dishes on cosmology and particle physics, speculates about black holes, time, and probability, and ends with some standard mooing about the mystery of consciousness and the beauty of our chilly universe. In all this, Rovelli shares the prejudices of most physicists, and he states them clearly and unapologetically, with the high-gloss claim-claim-claim-claim style familiar to viewers of the Discovery Channel. For readers who just want The Truth — hold the arguments, thanks — I imagine that Seven Brief Lessons on Physics is a highly stimulating gift. It is tempting to overinterpret the gulf between Munroe and Rovelli, with Munroe as an example of how science types address each other and Rovelli an example of how scientists, from their empyrean heights, address the public. A leftover “two cultures” talk awaits here, ready for rewarming. 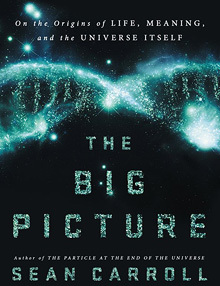 And maybe that talk would be in order, were it not for one more physics book that tottered into the top ten of June 2016 — Sean M. Carroll’s The Big Picture. Carroll, an American cosmologist and physics professor at the California Institute of Technology, commented in an interview with New Scientist that “this is the book that should accompany the Gideons Bible in all hotel rooms in the world,” and though this was a half-joke, it gives you some idea. Carroll’s rhetorical slant is different from either Munroe’s or Rovelli’s. Chapters in The Big Picture have titles like “The Fundamental Nature of Reality” and “The Effective Theory of the Everyday World,” but Carroll doesn’t aim just to refine the knowledge of the converted, nor just to bring outsiders in. That should be enough for a few hundred pages. Probably too much, actually. The Big Picture is a messy, patient book, stuffed to the brim with arguments and anecdotes, reminders and reviews. As an unusually ambitious attempt to cram the whole purview of modern physics into a single volume, it betters many other “big picture” books of recent decades. For instance, David Deutsch’s The Fabric of Reality (1997) prefigured Carroll’s scientific content (especially its treatment of Everettian quantum mechanics) almost point for point, but unlike Deutsch, Carroll doesn’t dismiss his opponents with a contemptuous sniff; instead, he reads their books. And The Road to Reality (2004), Roger Penrose’s enormous — and enormously difficult — attempt to fit all modern physics between two covers, certainly has more breadth than Carroll’s, but, unlike Penrose, one can read Carroll without a math degree, and without setting aside years to work through problems in the footnotes. So The Big Picture fills a gap in the literature. It’s opinionated but not unfair, credible but not unreadable. Nevertheless, with ambitions reaching far beyond physics, Carroll falters when he leaves his bailiwick. The Big Picture is split into six parts — Cosmos, Understanding, Essence, Complexity, Thinking, and Caring — each of which addresses a big question. Respectively, the parts address how a complex universe can emerge from basic physical laws, how we can discover these laws, what we already know about them, and what implications they have for the evolution of life, and for consciousness, and for human values. The topics broached in The Big Picture make an impressive word cloud: Boltzmann Brains and Laplace’s Demon, the Chinese Room and French existentialism, effective field theories and entropy, genetic algorithms and modal reasoning, panpsychism and philosophical zombies, Turing tests and transcendence, and much else besides. Carroll takes great pains to introduce readers to a philosophical perspective on science, casting standard views in philosophical language. This is an unusual choice for popular physics, a genre in which philosophy is usually mentioned only to say how unproductive it is. Carroll, however, wants readers to distinguish ontological from epistemological claims, and induction from deduction from abduction. Within poetic naturalism we can distinguish between three different kinds of stories we can tell about the world. There is the deepest, most fundamental description we can imagine — the whole universe, exactly described in every microscopic detail. Modern science doesn’t know what that description actually is right now, but we presume that there at least is such an underlying reality. Then there are “emergent” or “effective” descriptions, valid within some limited domain. That’s where we talk about ships and people, macroscopic collections of stuff that we group into individual entities as part of this higher-level vocabulary. Finally, there are values: concepts of right and wrong, purpose and duty, or beauty and ugliness. Unlike higher-level scientific descriptions, these are not determined by the scientific goal of fitting the data. We have other goals: we want to be good people, get along with others, and find meaning in our lives. The naturalism in poetic naturalism is the conviction that the world is all there is, and that regular patterns can be discovered throughout it via observations. The poetic part is the idea that there are many correct yet different ways to describe the underlying natural reality, that each of these is a “way of talking” about it — a phrase he uses often throughout the book — and that all of them should ultimately be able to fit together (similar to what E. O. Wilson calls “consilience”). This already suggests a major difference between The Big Picture and previous prominent attempts to summarize vast realms of knowledge for the general reader, such as Will and Ariel Durant’s The Story of Civilization and H. G. Wells’s The Outline of History — that is, The Big Picture leaves out history. On the face of it, this might not seem to be a problem. After all, Carroll gives us the greats (Galileo begat Newton begat Maxwell begat Einstein), and, like any good essayist, he peppers his arguments with anecdotes. Besides, his book does not pretend to be about history. But as topics progress from the physical universe to the human world, the arguments get progressively less convincing, and one wonders if this background-as-afterthought approach might be a part of the reason. Where poetic naturalism leads us right, it’s like the rogue hero of a picaresque novel, a stand-in charmer on the long path toward truth. But what about where it leads us wrong? What then about its hidden assumptions and formative insights? As a writer of expository physics prose, Sean M. Carroll is a master. A few years ago I took a general relativity course that used his Spacetime and Geometry textbook, which was helpful and lucid. Later, when I taught high school, I recommended The Particle at the End of the Universe, his primer on the Higgs boson, to any and all interested students. Today I continue to read his blog, Preposterous Universe. Carroll’s explanations seem effortless, and even when he stakes out positions I disagree with, I often find myself accidentally nodding along. In the best parts of The Big Picture, Carroll communicates science at a level of sophistication that rarely makes it into popular books. I especially admire his treatment of what, following Frank Wilczek, he calls the “Core Theory”: the Standard Model of particle physics, plus general relativity for gravity. Like every other science writer, Carroll mentions the tension between the two — the Standard Model is a quantum theory, with all the indeterminism that implies, while general relativity is entirely deterministic — but he also explains why these theories won’t ever be simply thrown out. The Core Theory, he writes, “includes everything going on within you, and me, and everything you see around you right this minute. And it will continue to be accurate.” Moreover, within its domain of applicability it will always be correct, which should allow us to draw certain broad conclusions. When Carroll goes through these conclusions, he is never less than thoughtful. To appreciate something of his evenhanded approach on scientific matters, consider the defense he gives for the Everettian interpretation of quantum mechanics — a view I find too extreme. In the 1950s, Hugh Everett proposed a new way to interpret experimental probabilities in quantum mechanics. Physicists have long known that experimental outcomes are probabilistic, since physical systems are hard to control, and since one’s knowledge of any system is necessarily incomplete. But early pioneers of quantum mechanics suggested that probabilities might mean more than this, that systems might be forced probabilistically into one state or another by the experimenter’s act of observation. Everett interpreted this idea in a peculiar way. He suggested that — even if, for a given experiment, we observe only one outcome — all other mathematical possibilities for a quantum system are still out there, somewhere, in some way. That’s true: a bad feeling, indeed, is not a principled stance. All a bad feeling can let you know is when you’re in the rough, where common-sense arguments have been stretched past breaking. But this is exactly where Carroll excels. Over and over he patiently works to convince readers that not only are his counterintuitive stances correct; after some thought, they should also seem reasonable. While I don’t agree with Carroll about Everett — with other interpretations of quantum mechanics available, an infinite complement of unobserved worlds seems wasteful to me — I like the way he makes his case. Every scientific claim Carroll makes is both concrete and probabilistic: concrete in that his proposals are ones that you can agree or disagree with, and probabilistic in that he admits his claims may be right or wrong, with some probability, based on the strength of known evidence. This anti-dogmatism is refreshing and quite unlike the unearned certitude of many popular physics texts. Which makes it all the more frustrating when Carroll trips on his own methods. Many of Carroll’s arguments are conscious applications of Bayesian reasoning, so named after Thomas Bayes, the eighteenth-century English minister and statistician who discovered a theorem for conditional probabilities. A conditional probability is written like P(A|B), which, in words, means “the probability of A, given that B is true.” Usually, scientific predictions have the form of P(data|model): you want to predict outcomes (the data) from a given theory (the model). But Bayes’s theorem inverts this. It allows you to find P(model|data), that is, to update your belief about whether a given model is true based on the measured data. Bayesian reasoning, in Carroll’s narrative, is our primary route toward secure knowledge, scientific or otherwise. One simply proposes a model, gathers evidence, and watches as the model probabilities increase or decrease. You don’t know. So you guess — which is to say, you assign numerical probabilities, P(yes) and P(no), based solely on your gut. Your crush approaches you in the hallway. Does said crush stop to say hello, or continue silently onward? In either case, you can generate probabilities based on another gut model: P(yes|crush stops) and P(no|crush stops), along with P(yes|crush continues) and P(no|crush continues). Then, with your new “data” (that is, whether or not the crush stops to say hello), you can update P(yes) or P(no), per Bayes’s theorem. “Don’t let the crunch of numerical detail obscure the main message,” Carroll instructs. He assumes that many readers will doze off once the math arrives, but the “main message” here is hard to suss even if one carefully tracks the numbers. Carroll wants readers to understand that Bayes’s theorem can help them to update their beliefs, but his story is an inadvertent parable on how the accuracy of Bayesian reasoning depends on the models we use to update our initial hunches. The initial guess, in this story, is whether your crush will say yes to a prom proposal. This much is understood as just a guess. But the second guess is a rough theory of human behavior, the “model” that allows you to interpret, via conditional probabilities, what it means if your crush stops, and what it means if your crush continues onward. The unfortunate fact here is that if you guess these probabilities incorrectly — the interpretations of your crush’s hallway proclivities — then Bayes’s theorem won’t help at all. Carroll’s model, in which your crush is “more likely to stop and say hi if they’re also inclined to go with you to the prom than if they’re not so inclined,” may be false, in which case Bayes’s theorem would give you worse estimates than you had at the start. Of course, Carroll doesn’t intend for us to take this example too seriously. It’s just a proof of process, an example of how specific data can help to update specific beliefs. But one can already see that the net of logic is frayed, and when Carroll tries to catch bigger fish, it will suddenly rip apart. The most obvious case of a fish tearing the net is in the chapter “Abducting God.” This is a case where I agree with Carroll on his conclusion even while I find his arguments rather weak. As he himself admits at the outset, “Thinking about God in a rigorous way is not an easy task.” Such thinking is especially uneasy because, as Carroll explains in an earlier chapter, people tend to occupy different “planets of belief,” which is just to say that people’s starting beliefs may differ so greatly that the same facts may lead them to widely divergent conclusions. Carroll doesn’t dwell on this. After citing Aumann’s theorem — the unsurprising result that, for people who rigorously follow Bayes’s theorem, the same initial beliefs and the exact same information will lead to the same final beliefs — Carroll simply posits that if we all update our beliefs often enough, we might near a consensus. “Even wildly different priors will eventually be swamped by the process of updating if we collect enough evidence.” By the time he argues how we should weigh our options for or against belief in the existence of God through Bayesian reasoning, those differing planets of belief seem to have been entirely forgotten. Carroll begins by demarcating theism and atheism as the two basic options — “for the sake of keeping things simple.” He allows that there are some fine arguments for either choice, and hence starts with P(God) and P(no God) each around 50 percent. He then considers what evidence might sway us either way. But this is where the argument gets shockingly dumb. Carroll supposes that we next should draw up lists of what features we should expect in a world with God, and what features we should expect in a world without God. So how would one do that? What about, say, the presence of evil in the world? Recognizing that there are many ways to square the existence of God with the presence of evil, Carroll tries to find a more definitive starting point and suggests we imagine a world where people always do good and never evil. “It’s hard to doubt that the absence of evil would be taken as very strong evidence in favor of the existence of God.” If we accept this, then “the fact that we do experience evil is unambiguously evidence against the existence of God.” Carroll goes on in this vein for a while — imagining what the world might be like if there were a God and then contrasting that to the world we in fact have — before he offers a potential piece of evidence that is admitted as a point in God’s favor: the fact that people have thought up the possibility of God’s existence. The chapter ends without a definite conclusion, but reminds us always to be good Bayesians. There are plenty of soft spots in this, from the false dichotomy between full atheism and full monotheism, to a failure to define “evil,” to a shoddy definition of God as “a person, as some kind of enormously powerful being who is interested in the lives of humans” — although Carroll later offers that “theism isn’t very well defined.” But the darkest bruise is the very premise that one can list the world’s attributes as either confirming or disconfirming God. This is one instance where a little bleed-over from history would help. Though it’s true that religious believers at times have insisted on aspects of their faiths that contradict well-established facts, in general this has simply not been the case. Brilliant minds are scattered throughout all major religions. To thoughtful religious people, Carroll’s approach of imagining what the world would look like if their religions were true must seem at least puzzling, if not contradictory and insulting. From different beliefs, the retort to Carroll is uniform. What would the world look like if my religion were true? Well, it would look exactly like this one. You see the problem. Carroll posits a “God” whose attributes — and the attributes of whose world — can be enumerated in absentia, more or less like a scientific model: We can imagine the model is correct, then make predictions about outcomes. But this isn’t the way most people approach religion. Just as God’s existence can’t be proven through argument (even if many have tried), one can’t very well discount religious experience by reasoning probabilistically that God is unlikely. Experience is the one thing, in the end, that can’t be denied. Much as we might like to imagine ourselves chilly Bayesian rationalists, I suspect that most of us are led to our fundamental beliefs via methods that are much less austere. We go around sniffing the world, rooting through rubble, turning over dirt. After all our searching, many of us find a world that smells like God. Many others (including me) don’t. Regardless of your convictions, there is a point here that many would-be Bayesians might overlook. Bayes’s theorem allows well-defined models — mathematically well-defined models — to be tested against observations. Now turn that around, and realize that without a well-defined model, Bayes’s theorem is nearly useless. This has important consequences. It means that Carroll’s faith in his probabilistic approach is overblown, like when he says that even though it is “enormously problematic” to apply Bayesian reasoning to the question of God, “we don’t have any choice.” It also means that for those aspects of your worldview that seep subtly into all your observations, math alone probably won’t change your mind. Then again, The Big Picture isn’t, at its heart, a math book. It’s a plausibility argument. The ideal reader might be a curious student who, having heard that science can account for the great universal mysteries, is looking for someone to address just how that might be. Throughout these discussions, Carroll takes on the mantle of a scientist writing journalism, not of a journalist writing science, and for the first two hundred or so pages, that approach undoubtedly works to his advantage. It is more convincing (not to mention, quicker) for Carroll to outline his own positions than it would be for him to construct a bricolage of quotes from his peers. But the farther Carroll wanders off his expert turf, the weaker the book becomes. It’s probably unfair to blame him for this. No one is equally comfortable in every context. But where a traditional journalist might slip comfortably into novice mode, shading in thin arguments with a telling anecdote about an eccentric genius or some gee-whiz details of an afternoon at the lab, Carroll is locked in as an expert — an expert, in this case, self-tasked with writing about the origins of life and meaning, and not just the big old universe. The book’s last two parts may be its most audacious. In them, Carroll tackles the questions about consciousness and morality that are sometimes presented to naturalists as inconvenient and possibly insurmountable. This itself is brave. “If there is any one aspect of reality that causes people to doubt a purely physical and naturalist conception of the world,” Carroll notes, “it’s the existence of consciousness.” This provides a solid reason to include this material in the book. But the really bold part is that these problems aren’t just presented as interesting, they’re presented as more or less solved. Over and over, we are asked to dissolve deep and perennial dilemmas via the Core Theory, to re-describe puzzles in terms of quantum fields, spacetime, and poetic descriptions thereof — and nothing more. This is a gamble — an unsuccessful gamble, but for the best reasons possible. The latter parts of The Big Picture fail because Sean Carroll explains his opponents’ positions too clearly. This makes the book’s ending something of an anticlimax, but only because the discussions, section by section, are models of intellectual honesty. Carroll’s skills as a summarizer are as keen as ever, but this cuts against him when his opponents have the better arguments. Now remember: Carroll’s basic position, the position he calls “poetic naturalism,” is that the universe microscopically runs on physics, but that there is no harm in also claiming as “real,” in an approximate, pragmatic sense, those macroscopic collections of microscopic entities, like molecules or chairs or people, that meaningfully simplify higher-level discussions. But just as Bayesian bookkeeping gave the hunt for truth over to mathematics, we will see how this idea that all descriptions of phenomena are only ways of talking about the physical facts yields an enormous explanatory credit to language, a credit that is overdrawn. For example, take the human experience of color. Most physicists think of color as an issue that is about one hundred fifty years past settled. Young children learn that different colors are caused by different wavelengths of light. And fine, sure, it gets tricky if you include rods and cones and RGB maps, but even then the basic experiments with additive color can be carried out with cellophane and flashlights, and the basic experiments with subtractive color just take crayons. As poetic naturalists, that’s basically what we’ll be doing. The attributes of consciousness, including our qualia and inner subjective experiences, are useful ways of talking about the effective behavior of the collections of atoms we call human beings. While I don’t agree that the problem is this simple, I can sympathize. For scientists, the methods of philosophers can seem perplexing. Consider a thought experiment, made famous by Chalmers, involving a “philosophical zombie.” Carroll’s discussion of this idea reveals how casually he dismisses the hard problem of consciousness as simply a way of talking about physics. In this story, the zombie passes as a normal person, doing and saying the same sorts of things you might expect a normal person to do and say. One might conclude that this zombie is a normal person, but for one difference: the zombie doesn’t have qualia — that is, it lacks internal experiences of any kind. That’s more or less the whole story. Chalmers uses it to draw a conclusion. Since we can conceive of a being that in every physical respect is like a human being but that lacks conscious experiences, and since we do in fact have conscious experiences, consciousness must be a non-physical property. According to poetic naturalism, philosophical zombies are simply inconceivable, because “consciousness” is a particular way of talking about the behavior of certain physical systems. The phrase “experiencing the redness of red” is part of a higher-level vocabulary we use to talk about the emergent behavior of the underlying physical system, not something separate from the physical system. That doesn’t mean it’s not real; my experience of redness is perfectly real, as is yours. It’s real in exactly the same way as fluids and chairs and universities and legal codes are real — in the sense that they play an essential role in a successful description of a certain part of the natural world, within a certain domain of applicability. The way Carroll bats away experience as mere vocabulary seems deeply wrong. It doesn’t matter whether one considers the experience of red or the experience of God. For individuals, these experiences constitute the most direct form of knowledge available. I don’t mean, by this, to suggest that most experiences can’t be explained, or, in some cases, explained away. But experiences are — always are — our primary data. Theories, no matter how sophisticated, will always be secondary to them. Which is why the redness of red is more undeniably real to me than legal code. My knowledge of redness may be sharpened by my identifying it as a perceptual category, but unlike legal code it is still a raw sensation, pre-linguistic and inescapable. Granted, consciousness may one day be understood so well that my insistence on the redness of red as mysterious might scan as parochial and naïve. But for the time being, my first-person experience of it is real to me in a way that can’t be easily dissolved. By missing this qualitative distinctiveness of subjective experience, Carroll fails to appreciate how consciousness might be anything other than a peculiar way of talking about physical stuff. He may not indulge in the worst fallacies of this sort — subjective experience, he grants us, is not something that happens “in the brain.” Rather, it is a concept “within a way of talking about things happening in the brain.” But in saying this, Carroll ignores that Chalmers and others mean something quite different when they talk about consciousness. Carroll wants the terms of our language to correspond neatly to facts of physics, such that all descriptions of phenomena are about those facts, while our language continually refers to things at once more direct and less explicable than the familiar fluctuations of the void. By the last pages of The Big Picture, when Carroll leaves science behind and moves into pure argument — an argument, no less, on the meaning of goodness — I wondered why I felt so irritated. After all, I admired the scope of Carroll’s project, and I agreed with many of his conclusions. But as he blew past one objection after another, I found my answer: More than anything, I was irritated by his optimism. This is where we learn about goodness, and where optimism leaps goofily off the page. Carroll gestures toward the usual moral philosophers — Hume and Kant, Foot and Searle — only to point out their flaws. In the end, he declares, there are no fixed criteria. Like James Naismith inventing basketball — Carroll’s odd analogy — we each must invent a morality, each with a self-constructed goodness, each according to self-defined goals. There’s no scientific reason that Carroll’s moral buffet couldn’t work. But in practice it’s hard to arrange a universal satisfaction. For this dinner alone, you can bet that the table’s vegetarians aren’t satisfied with the outrageous cruelty of the table’s omnivores. Then add in some historical grievances, some cultural disagreements, some political overtones, and soon our table mimics the fractiousness of life. Carroll doesn’t touch on anything like that. No doubt he values diversity — two of his Ten Considerations (meant, yes, to replace those other ten) are “There Is No Natural Way to Be” and “It Takes All Kinds” — but in Carroll’s ideal world this diversity is oddly circumscribed. One of the main forms of real-world diversity is the diversity of belief, but when you’ve written several hundred pages on what scientific notions are so secure that everyone should accept them, you can hardly turn around afterward and say, “Well, think whatever you want.” Carroll seems to want it both ways, with agreement on the fundamentals (that is, on the ideas contained in The Big Picture), and diversity on everything else. But any vision of the world where there are universally agreed-upon fundamentals seems so unlikely as to be poignant, a world so far from our own that a probability for it can hardly be assigned. David Kordahl, "Pop Goes the Physics," The New Atlantis, Number 52, Spring 2017, pp. 87–99.